It's been a week since I checked on my blog, had been on a trip to Coorg and came back only on Saturday. It was a different kind of a vacation, very relaxed and peaceful, saw for the first time, a coffee estate, learnt a little more about what goes into that morning cup of coffee. We also visited Talakaveri, the place of origin of the river Kaveri, a holy pilgrimage for the Hindus. We also got to taste a little bit of the local Kodava cuisine, Coorg food, I would be trying out some of the dishes and posting them here later. Now coming to today's post, it's the simple aval upma or poha, this is one upma that my daughter likes and I have been trying out different versions of this simple and humble upma. I have already posted one, Pepper And Jeera Aval, and today it's going to be another one, here we are flavoring the rice flakes/ aval/ poha with lemon, ginger and green chillies. It's such a simple dish, can be put together in under 20 minutes and makes a good breakfast or an after school snack..
Wash the poha a couple of times, drain and keep for about 10 minutes. In the meantime, heat some oil, add the peanuts and roast for 2 minutes, then add the urad dal and mustard seeds. When the mustard seeds start spluttering, add the asafoetida, followed by the onions, green chillies, ginger and curry leaves. Saute till the onions turn pink, then add the turmeric powder and salt and mix for a few seconds. 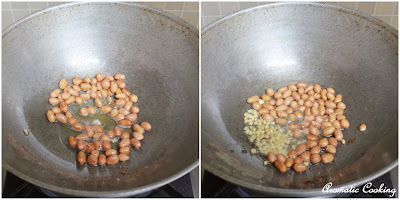 Now reduce the heat, add the drained aval and mix it well till it's slightly warmed up. Finally add the lemon juice and the coriander leaves, mix once and remove. Serve it garnished with some sev. I have used aval that's neither too thin nor too thick, if you use a very thick one, then you have to soak it for some time, then drain and use, don't use the very thin variety, it'll become very mushy. Sev is deep fried chickpea flour noodles that can be made at home or it's readily available in Indian stores. 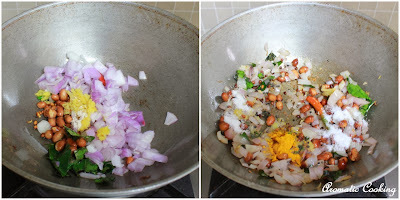 You can also use aloo bhujia (potato noodles), I have used that only, instead of plain sev and if it's spiced up and has chat masala in it, then leave out the lemon juice. We like the upma texture to be a little soft, so I just leave a tablespoon or more of water with the aval when draining it, this water is absorbed by the aval and makes it softer. 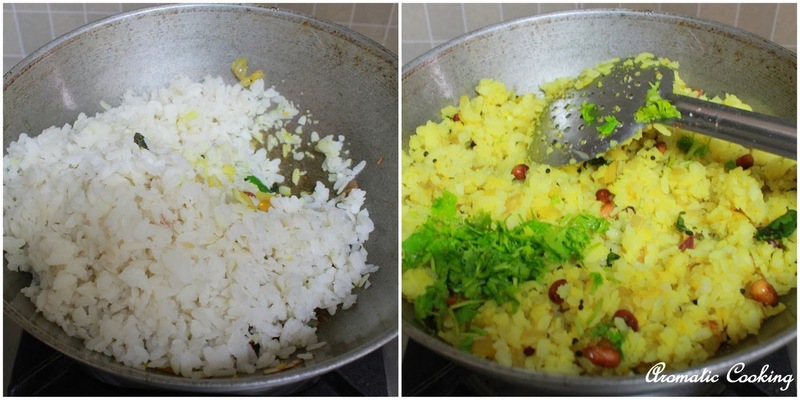 You can also add some cooked potato pieces or green peas and also some grated fresh coconut for extra taste and flavor. 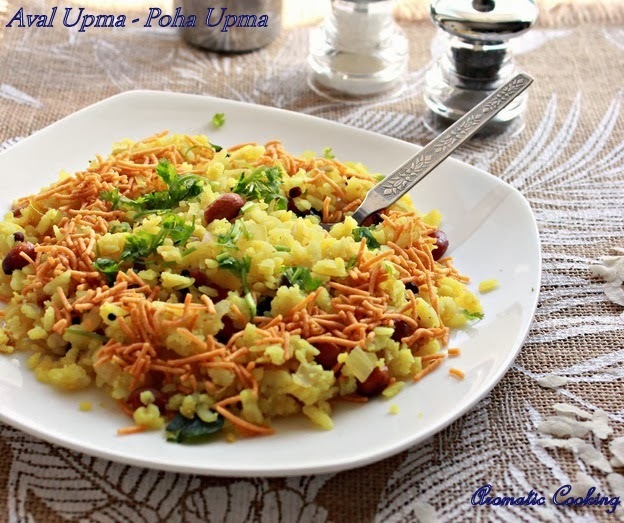 Hema you made this poha upma an exotic looks dish love it, with those sev and peanut. Yummy colorful upma,makes me hungry. Hope you had lots of fun. 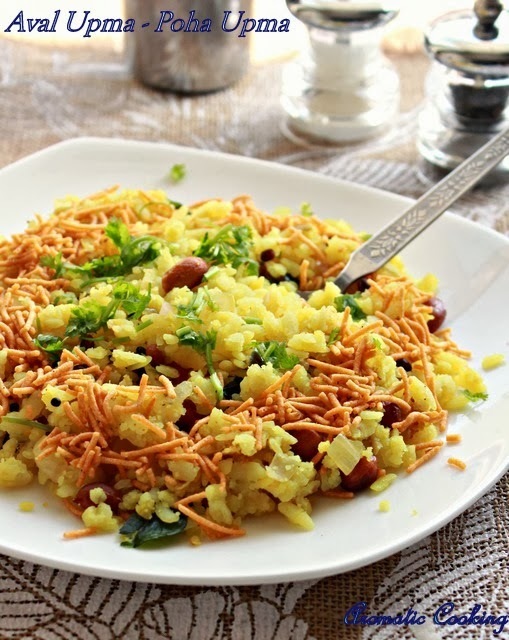 simple and lovely poha. Your Aval upma looks so lovely & crunchy with those sev. It infact looks like a yummy chat. wow nice kootu hema I love the idea very innovative.